In a glitzy affair last Wednesday — at the Newport Performing Arts Theatre in Resorts World Manila where, two years ago, we watched the musical, “The King and I” — the Top 40 were introduced to the public. But first, a rewind: Back in 2000 during the Silver Anniversary of the league, the “25 Best Ever PBA Players” list was introduced. Who were the names included then? Led by Cebu’s pride Ramon Fernandez, the list included Robert Jaworski, Alvin Patrimonio, Bogs Adornado, Abet Guidaben, Benjie Paras, Atoy Co, Freddie Hubalde, Philip Cezar, Ricky Brown, Johnny Abarrientos, Ato Agustin, Francis Arnaiz, Hector Calma, Jerry Codiñera, Kenneth Duremdes, Bernie Fabiosa, Danny Florencio, Jojo Lastimosa, Lim Eng Beng, Samboy Lim, Ronnie Magsanoc, Vergel Meneses and Manny Paner. My favorite shooter Allan Caidic made the cut. Fast forward this week, the PBA Board, in their “Ruby Anniversary,” called the party, “Fab@40.” Who additional 15 honorees were included? Jimmy Alapag leads the list. He’s joined by James Yap, Danny Ildefonso, Willie Miller, Asi Taulava, Eric Menk, Kelly Williams, Jayjay Helterbrand, Jimmy Alapag, Mark Caguioa, Arwind Santos, Jayson Castro, Marc Pingris, Kerby Raymundo, Chito Loyzaga and Marlou Aquino. The party last Wednesday was special not only because it brought the awardees together in formal wear — everyone wore suits except the Barong Tagalog-wearing Codiñera — but also because it was a show: ballplayers walked the ramp wearing various summer and informal wear and the league launched new products including the PBA credit card, the Life magazine and a video game. Valid point. This, of course, is the danger with presenting any “Best Ever” awards. With hundreds of players to choose from, there will always be some deserving names who’ll be left out. What was the criteria used to select the Top 40? The panel listed four items, summarized as follows: the player must have played at least four full seasons, must have been a major awardee (MVP or others), must have made a major impact and contribution towards basketball. The criteria seems fair. But some are questioning the selection process. It appears that the panel (back in Dec. when the names were released) did not consult a wide range of experts and did not meet at length and on several occasions. My take? 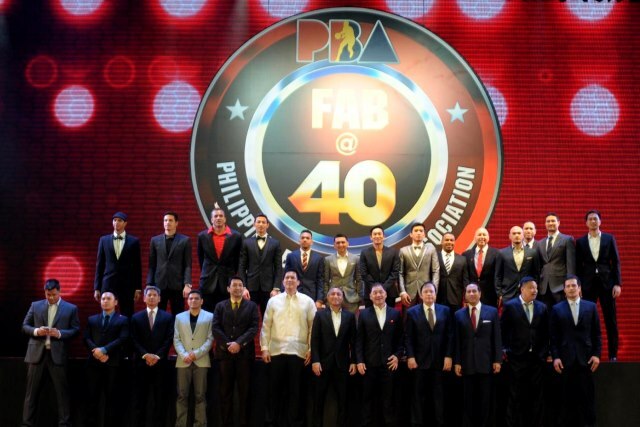 The PBA should have been more patient and waited for the Golden Anniversary. To this, I urge you to read “Lessons for the PBA’s 50th” by Bill Velasco.